A specially formulated gasket sealant for Automotive, Truck, R.V., Marine and Industrial applications. Seals glass, aluminum, fiberglass and foam. Adheres to painted surfaces, most plastics, rubber and wood. Also can be used for plumbing and electrical applications. When cured, stays flexible from -60°F to +500°F. Replaces cork and rubber gaskets on engines and transmissions. 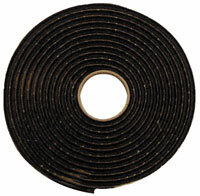 A non-sagging solid butyl tape for auto and truck windshields and back lights. Bonds and seals immediately on contact. Powerful adhesion. Will not break away from glass. Length: 15 feet.